Plan of Improvements of City Hall Park. 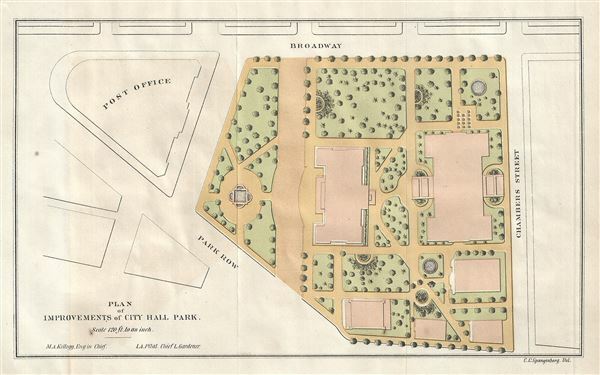 A scarce 1871 map of City Hall Park in New York City by Kellogg and Pilat. The plan covers City Hall Park, the seat of the City government, located in downtown Manhattan. In the late 17th century, the area was a pasture outside city limits known as the Commons, with a Native American trail running along its western boundary (now Broadway). Several buildings, including an almshouse dating to the late 18th century (archeological evidence of which was unearthed in 1989), a prison, a parade ground, a public execution site, a museum, a post office and a city hall have been built on this site over the years, with The City Hall being the only building remaining to this day. In 1765, the first public protests against the British were held in the Commons. The replica of the 'Liberty Pole,' built to commemorate the 'Stamp Act' protests now stands between Broadway and City Hall, near its original location. In 1871, the Croton Fountain, built in 1842, was replaced with a new fountain designed by Jacob Wrey Mould. This plan, by Parks Engineer in Chief M. A. Kellogg and Chief Landscape Gardener I. A. Pilat illustrated the improvements of City Hall Park including the new Mould fountain. The fountain, which was temporarily relocated, was returned to City Hall Park in 1999 where it stands to this day. This plan also notes the location of the Post Office. Built in 1867 on the southern tip of the park, the Post Office would be demolished in 1939, to restore the original triangular shape of the park. The park has since been redesigned, but some of the elements of this 1870 plan can still be seen today. Thanks to the efforts of Kellogg and Pilat, the citizens of New York City have the privilege of enjoying what is, without question, one of the finest examples of a planned urban public recreation areas in New York City. This plan was created by M. A. Kellogg and I. A. Pilat for the First Annual Report of the Board of Commissioners of the Department of Public Parks for the Year Ending May 1, 1871. Maps of City Hall Park are exceptionally scarce, making this a rare find and an important addition to any serious collection focusing on New York City.